Although often outshined by the Flying Biscuit Cafe across the street, Tex-Mex cafe Gato in Candler Park has slowly earned a solid reputation for affordable morning grub with a Latin twist. Moreover, the restaurant’s history of inviting chefs to host prolific pop-ups over the years, including Talat Market and BATON Supper, made me confident that Gato owner Nicholas Stinson’s own attempt would meet that standard. So imagine my surprise when the restaurant’s weekend pop-up “Gato Nights” felt like a pretty mediocre evening of dining. The pop-up does not work hard to create a carefree, leisurely environment in the restaurant. The limited menu, slow service and small portions seem to indicate to customers that they are not the most important component of the night. This apathy for the patron ultimately created my group’s distaste for both the meal and the mood. The Latin-inspired menu is no bigger than a wedding invitation and offers only a handful of dishes that rotate weekly. Some are small and others more robust. 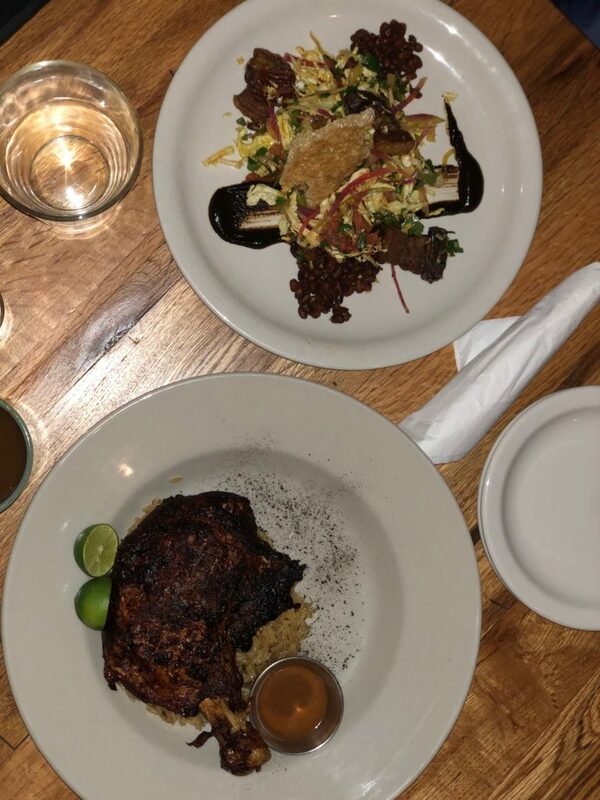 Our group of five ordered a plate of the adobo chicken quarter and seca soup rice, chicharra en salpicon (pork belly salad), mole coloradito with fall vegetables and two red corn tamales. I ordered a hot cup of winter tamarind, a confusing concoction that tasted like hot cider and tamarind chutney. This was partially so I could claim I reviewed all the components of the restaurant, but also because the restaurant is BYOB and offers no other drinks, save for a salty limeade which didn’t sound particularly appetizing either. For the most part, my fellow diners and I agreed that none of the dishes we tried, except for the adobo chicken, truly merited strong praise. No food was poorly constructed or undercooked, but even so, no flavors popped out. Let’s start with the bad. The chicharra, mole and tamales didn’t impress the majority of the group. We expected the chicharra to focus more on the pork, but the meal seemed imbalanced by the overbearing amount of cabbage which effectively made the dish an exorbitant lettuce bowl. The mole was adequate, but was served with so few vegetables and tortillas that it resembled slop on a plate. It was clear that the tamale (along with the tortillas) contained fresh, prepared corn, but the lack of flavor to accompany it made the dish feel incomplete. And speaking of incomplete, halfway through my spiced tamarind drink, pretty unsavory chunks of tamarind started to become lodged in the back of my throat. The beverage could’ve used some blending, and the menu could’ve used some work. There were some redeeming parts of the meal.We fawned over the adobo chicken and rice, which was moist and flavorful. By the end of the meal, we had scraped the plate clean. The ingredients may not have been combined perfectly, but their quality was apparent. The vegetables were fresh and clean. The restaurant, though cramped for five, was intimate. Sparse lighting combined with candles on each table made the space calm and peaceful. Beyond this, I’m hard-pressed to find anything else to celebrate. I walked away from the meal about $19 lighter, but if I were to go again, I’d order more. After dinner, we stopped at Taco Bell to fill the void Gato Nights left in our stomachs. It was clear by the end of the night that Gato was probably not aiming to cater to undergraduates students — most of the clientele inside the restaurant appeared well into their 40s, if not older, and you’ll need a little bit of spending latitude to drop up to $17 on microscopic portion sizes. I probably won’t be returning to Gato anytime soon, but I have a feeling my parents might like it. If you’re looking for light dishes to share, Gato is your best bet for dissatisfying Latin food.